Surrounded by gardens and blue lagoons, The Leela Goa Beach Resort offers luxurious rooms with a DVD player. Facilities include a 12-hole golf course, a 24-hour casino and an outdoor pool. Rooms are elegantly furnished and feature a balcony overlooking the lagoon. They come with a satellite TV, CD player and minibar. Private bathrooms come with a bathtub and hairdryer. Guests may enjoy Ayurvedic massage and yoga sessions at the spa, or arrange a sunset cruise at the tour desk. The Leela also provides a tennis court and pottery making classes. 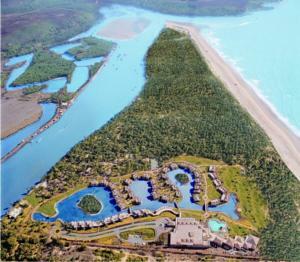 The resort is located 25 miles from Goa Dabolim Airport. Panjim, the capital city, is around 30 miles from the hotel. Leela Goa offers 7 food and beverage options, with cuisines ranging from local Indian dishes to Italian food. A daily breakfast buffet is also available. Wi-Fi is available in the entire hotel and costs INR 453 per hour. Free! One child under 5 years stays free of charge when using existing beds. Free! One child under 2 years stays free of charge in a baby beds. There is no capacity for extra beds in the room. Maximum capacity of baby beds in a room is 1. Any type of extra bed or crib is upon request and needs to be confirmed by the hotel. American Express, Visa, Maestro The hotel reserves the right to pre-authorize credit cards prior to arrival.